Is it spring yet? No? Crap. Living in the Midwest, one gets to deal with lots of, well, winter in the Winter months. Um, I'm done with that. Do you hear me, Mother Nature? D.O.N.E.! I am ready for a break from the cold and below zero temps. Just sayin. On a cheerier note...it's time for another Action Wobble card! Have I mentioned that I love these wobbles? I have? THAT many times? Yikes. Must be I really love them! lol. I used the bird from the 3 Birds on Parade cartridge and cut it at 3". The feathers are from a pack of feathers I had in my stash. And the background paper was created by me using Gelatos. Now, because the feathers are curved, it doesn't wobble wildly. Just a gentle little shake. And I added a clear piece of acetate to be able to make it wobble. I wanted the tail feathers to be the only part wobbling, so I added a cardstock "bridge" over the Action Wobble so the bird body could be stationary in front. 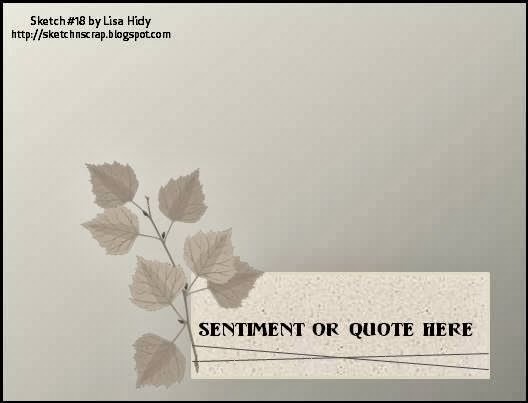 I printed the sentiment using a label printer and cut the strip into pieces for a free-form style. 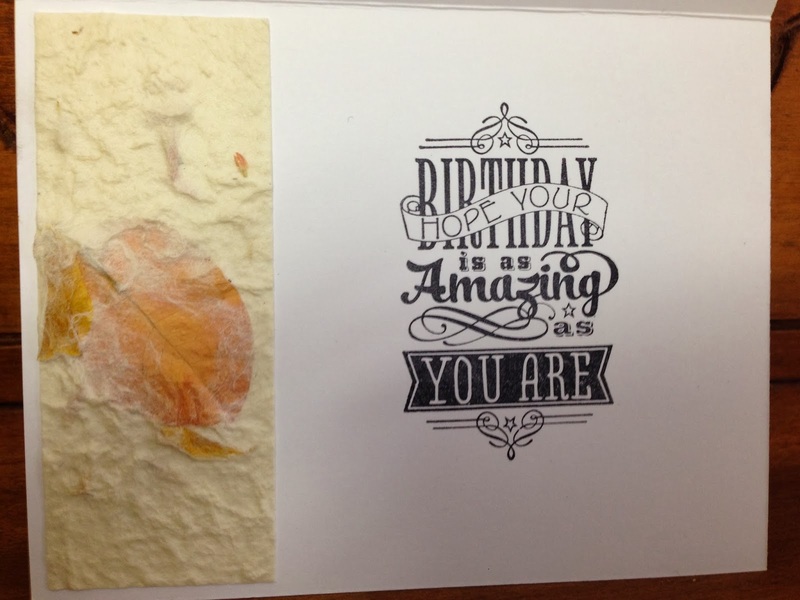 For the inside of the card, I added a stamped sentiment which fit perfectly with the front. Hope you enjoyed visiting me today. If you'd like to pick up some of these Action Wobbles for yourself, you can find them at The Scrapbooking Queen's site on Facebook. Want more inspiration? Visit the Action Wobbles Blog and join us for our Wobble Wednesday Challenges! Hope to see you there! 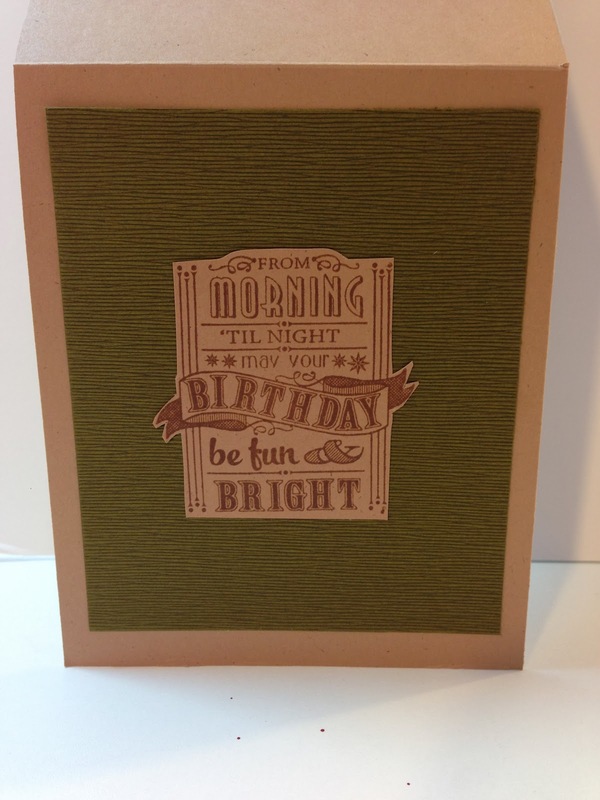 We are mixing it up over at Fantabulous Cricut Challenge Blog. What fun it was creating with so many patterns! For my three (well, more like six) patterns, I created a background. I used a variety of patterned washi tapes on a black piece of cardstock, leaving just a small space between each piece. 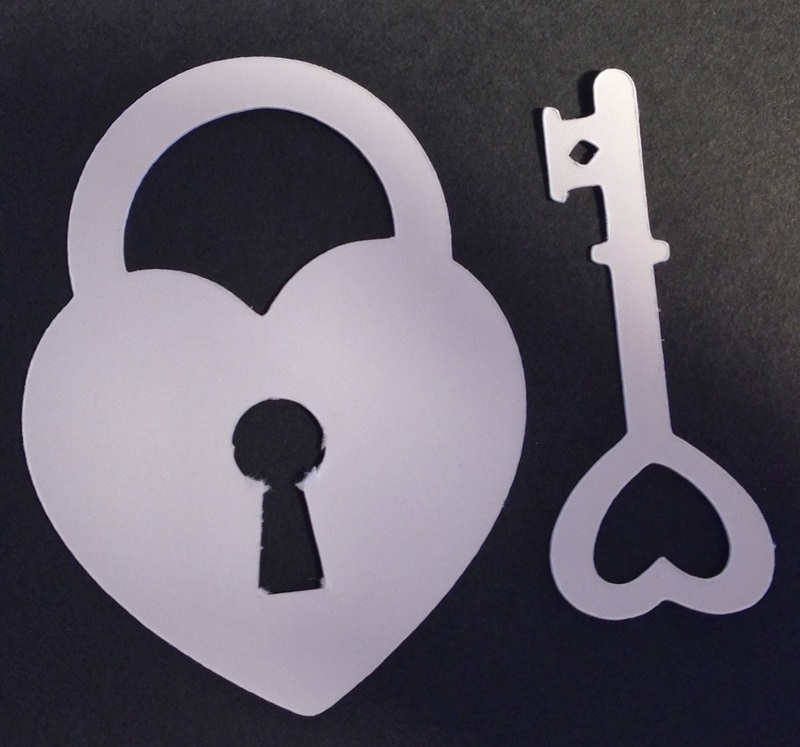 The heart and key were cut from the Spring Fever Collection. I cut those at 3" on white cardstock. To create the metallic look, I pressed each piece into a Versamark ink pad and heat embossed with metallic embossing powder. 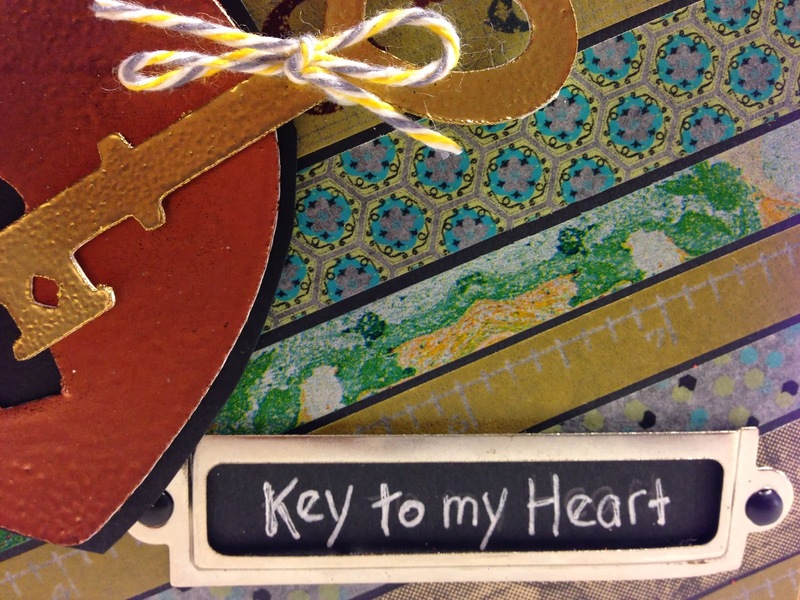 I attached a metal plate to the cardstock with a couple of black brads and added a hand-written sentiment. And there you have it. Hope you come play along with us. You can win some fabulous prizes! The Robin's Nest - I'm Wild About You! 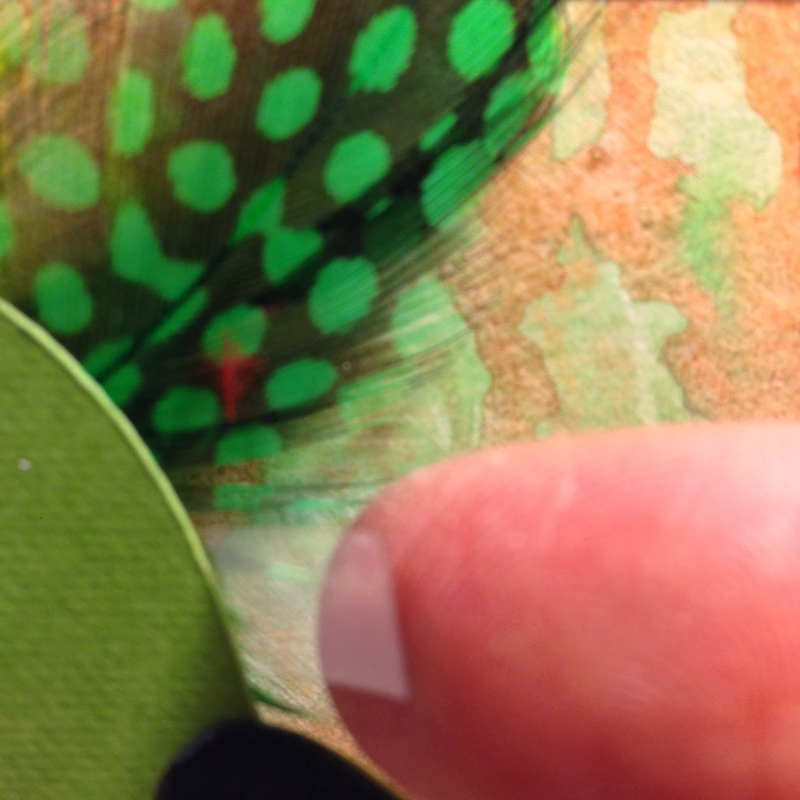 Now if you'd like to see the whole post and the full picture, head on over to The Robin's Nest. Let me know what you think. 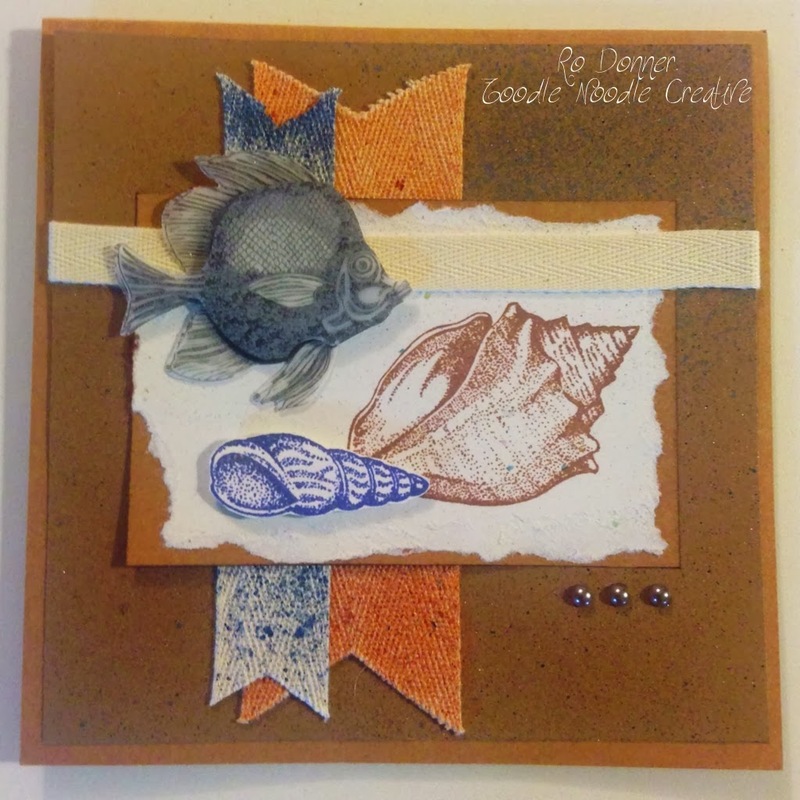 It's time for another card sketch challenge at SNS and I am dreaming of SPRING! I look outside my window and still see oodles of snow and cold (although at least we are above zero these past few days). My mind can't help but wander to warmer times. So let me share a little greenery with you! Isn't that paper lovely? I used some veined leaves and greenery that I also purchased at APO. I love those veined leaves...they are so delicate and shimmery. 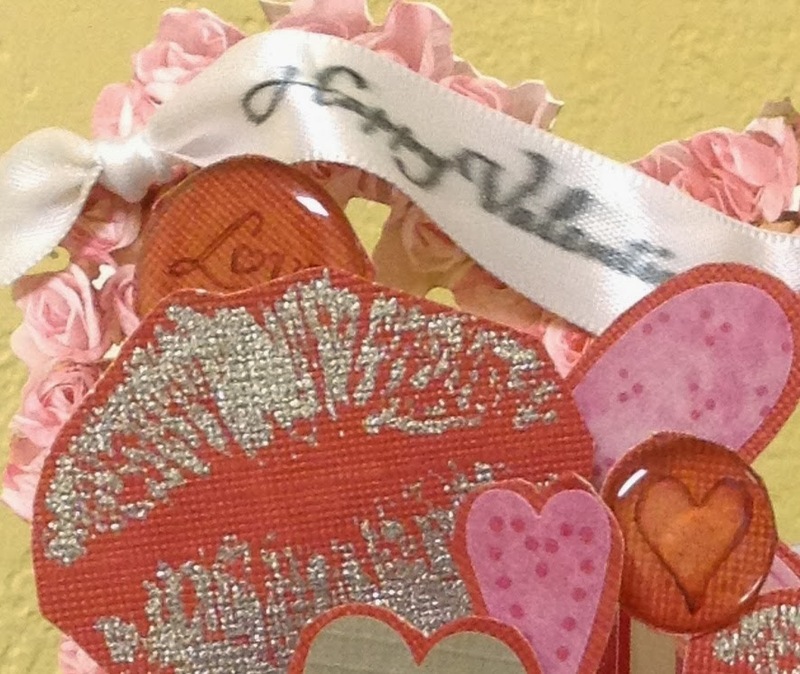 The vellum tag was adorned with a rub-on and a little ribbon. 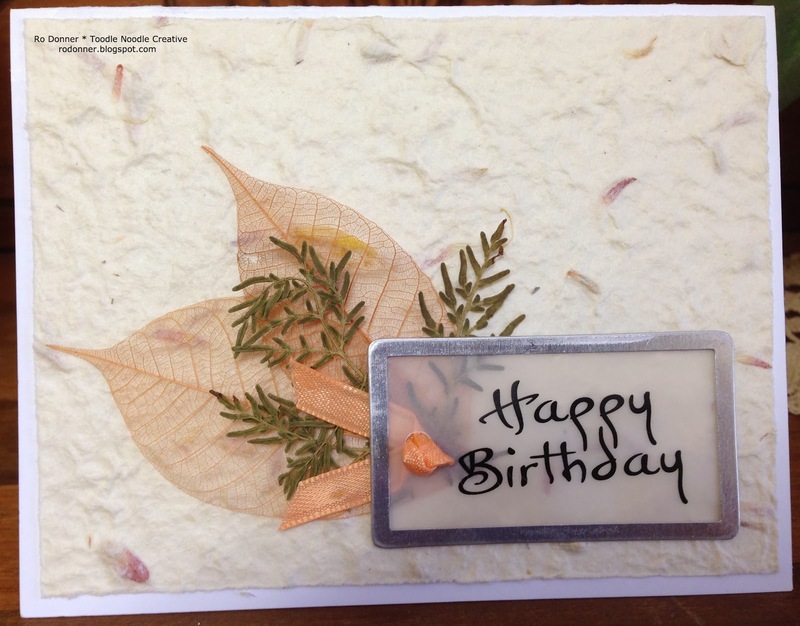 For the inside of the card, I added a sentiment from Hot Off The Press and a little more handmade paper. 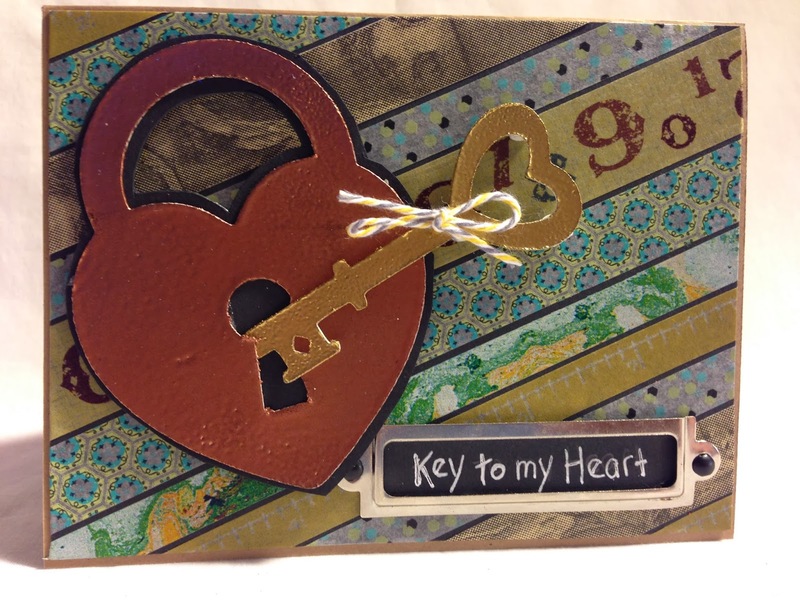 I would love for you to head over to SNS and see all the amazing cards designed by my teammates. They are sure to inspire you to play along with us! We have some great prizes this month by our sponsor, Skyline Paperie. Hope I was able to share a little warmth with you today. 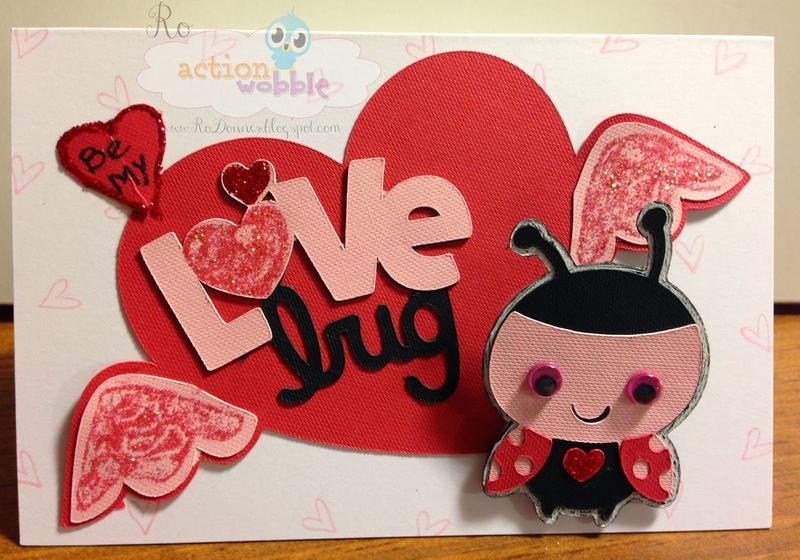 Be Mine Action Wobble Bug! Today's post is all about cute and wiggly. 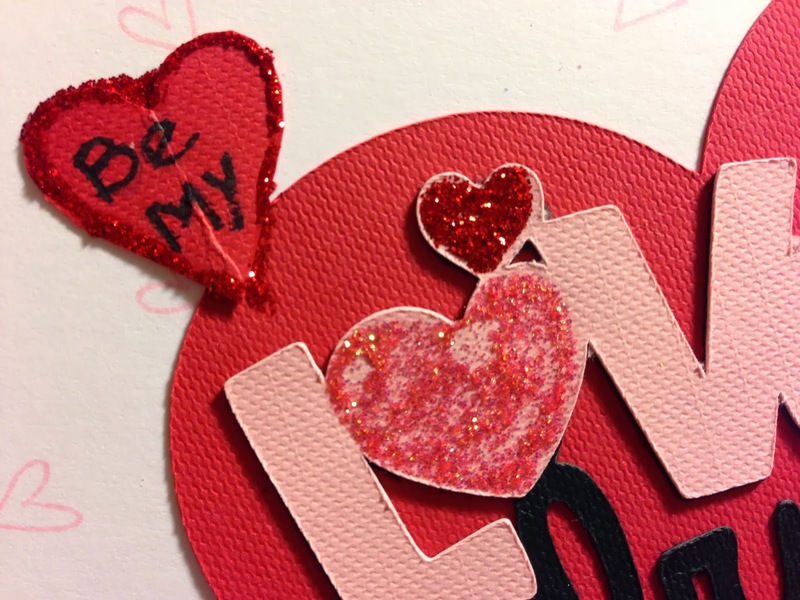 Valentine's Day is approaching, so it's not too early to start on those cute little Valentine projects. 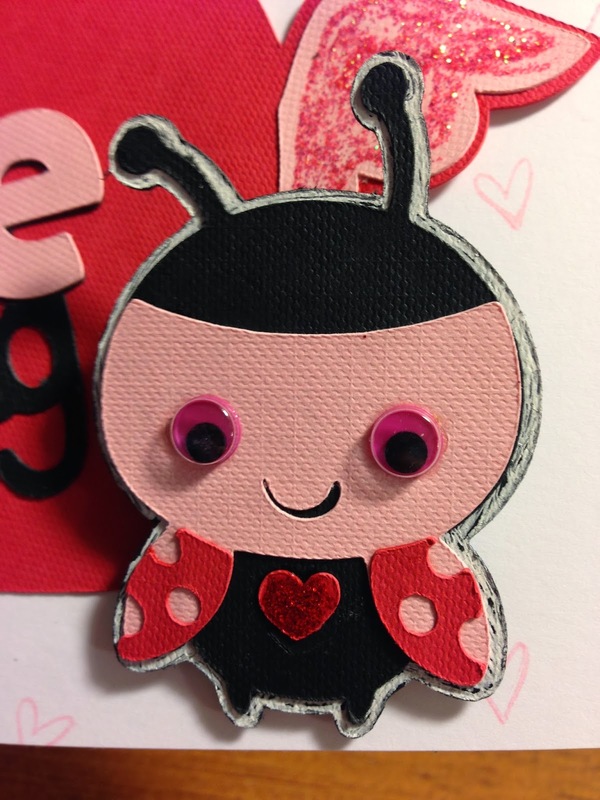 I have for you today a sweet little card featuring an adorable bug with an Action Wobble. How cute is he? 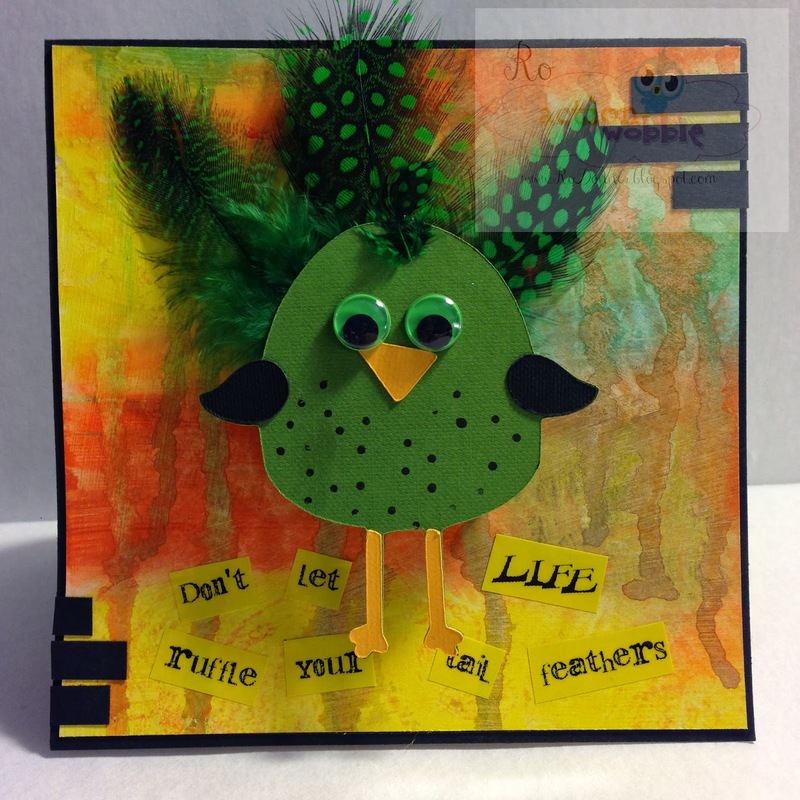 This busy little guy was created using the Create A Critter cartridge. I cut the bug at 2-3/4", the heart with wings at 3", and the sentiment at 2.25" (I think). I used the Cricut line of papers. They cut so clean and nice. 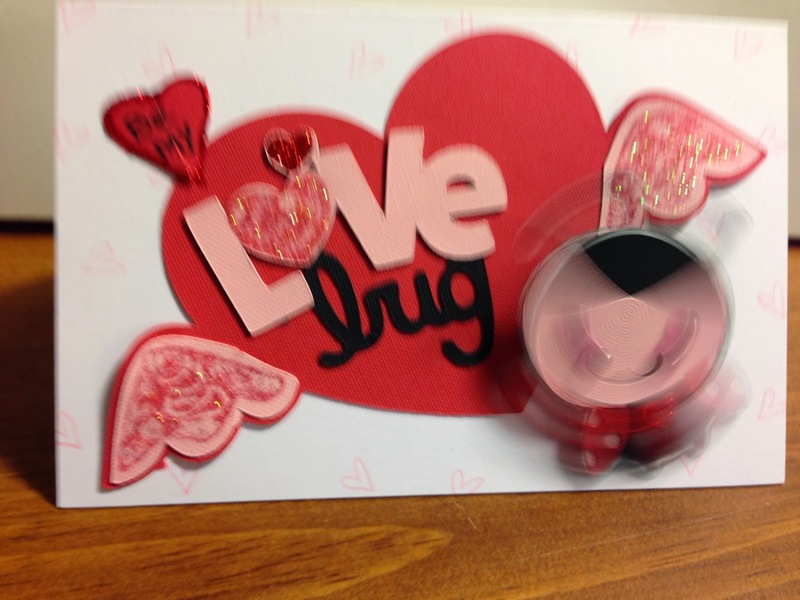 And what special Valentine would be complete without an Action Wobble? After layering all my parts, I stamped the cardstock with a Stamps By Judith peg stamp and added some Stickles to the hearts and wings. I love how it turned out, and my granddaughter, Kaileigh (she's 3-1/2) thought it was the coolest thing ever. This one is for her little sister, so I guess I need to make one for her next. Action Wobbles are so much fun. 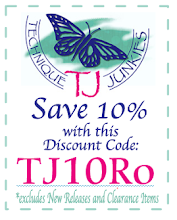 If you would like more information on purchase, click on the link below. I would love for you to visit the Action Wobbles Blog and see all the great projects the Design Team has to share. New projects are being posted all the time. And join us for the Wednesday Wobble Challenges. It's time for another weekly challenge over at the Fantabulous Cricut Challenge Blog. 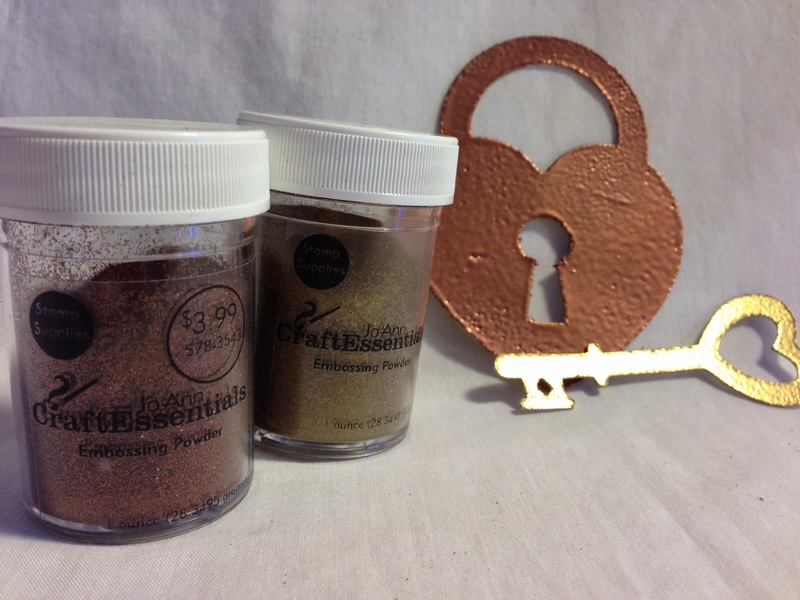 The winner will receive a stamp set of their choice. 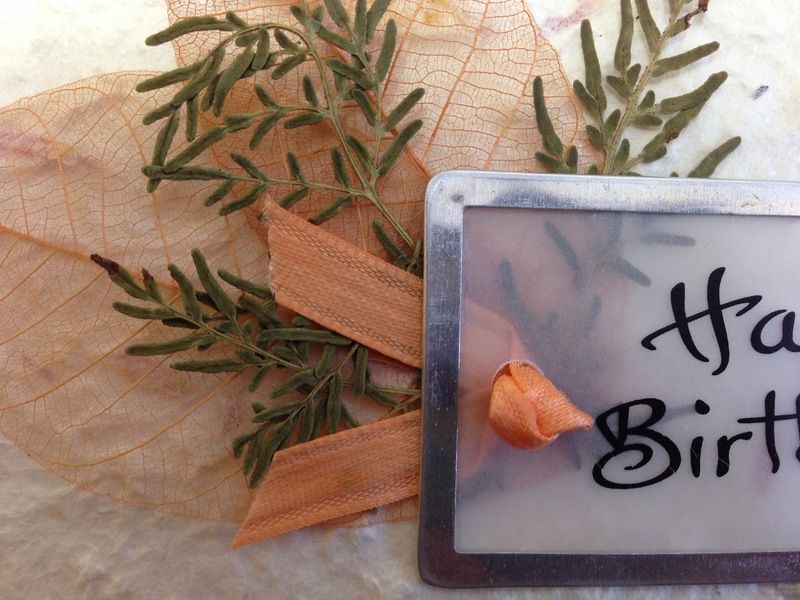 As I look outside my window and see the two feet of snow that we were blessed with here in the Mitten, I am freezing inspired to create a wintery birthday card. And when I think of winter, I think of snow. 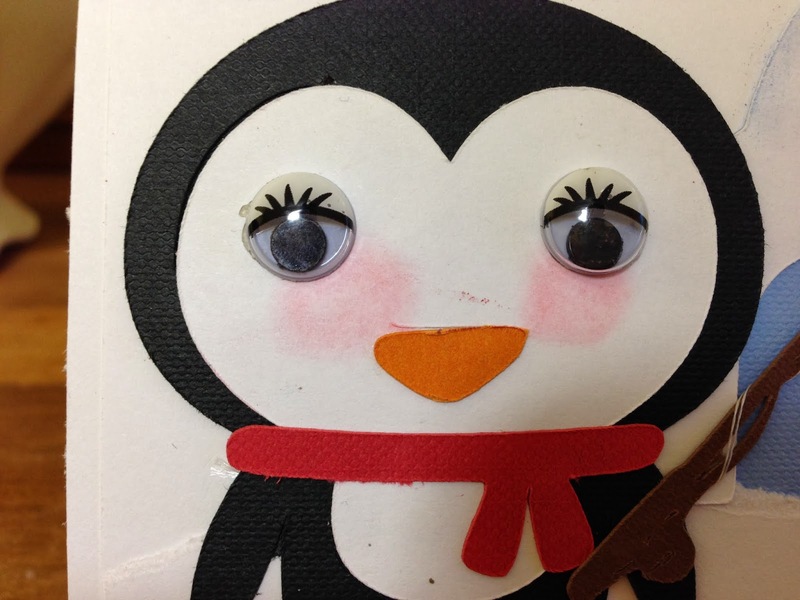 When I think of snow, I think of penguins! This fun little guy from Create A Critter was perfect! I cut the penguin and igloo at 2.75" and assembled them. 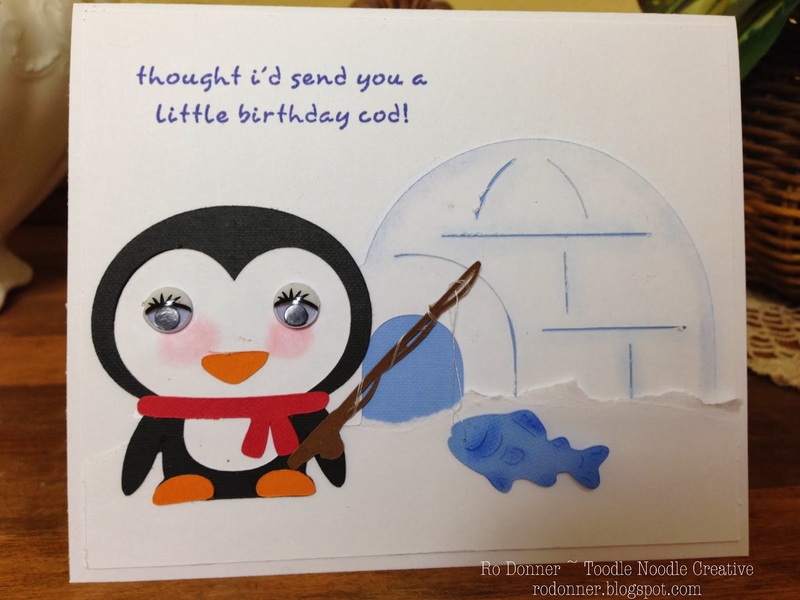 The fishing pole and fish were cut at 2.25" and are from the Everyday Paper Dolls cartridge. A torn piece of cardstock for snow and a stamped sentiment complete this fun card. Come play along with FCCB for this weeks challenge! Head over there now to see all the fun projects from the Design Team. You will get lots of inspiration! I don't know if that's true or not, but I have three versions of a project to share with you today, and I think they're pretty good! I am thrilled to be starting my second term with The Robin's Nest and I thank them so much for having me back! I look forward to sharing with you for the next six months, and hopefully you will be inspired to try some of the great projects the Design Team will be showcasing. These 5"x6" calendars were so much fun to make. If you'd like to see more photos (including each individual calendar and close-ups of the embellishments) and information on how you can make these yourself, head on over to The Robin's Nest and see the complete post! My First Sketch Challenge as a DT Member with SNS! And I am so geeked! 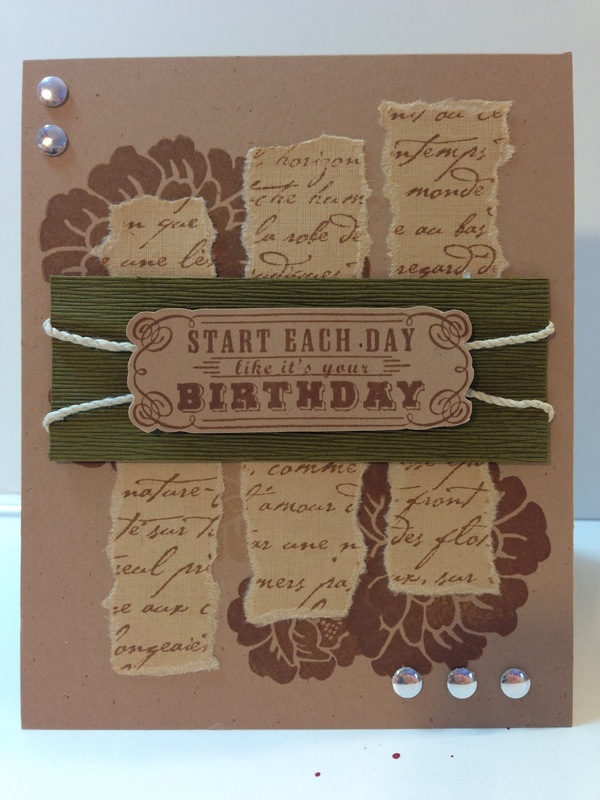 Each month, Sketch~N~Scrap posts layouts on their blog for both scrapbooks and cards. If you are feeling stuck or uninspired, I urge you to check out their blog. You will find inspiration and ideas in abundance. The Design Team is amazing! 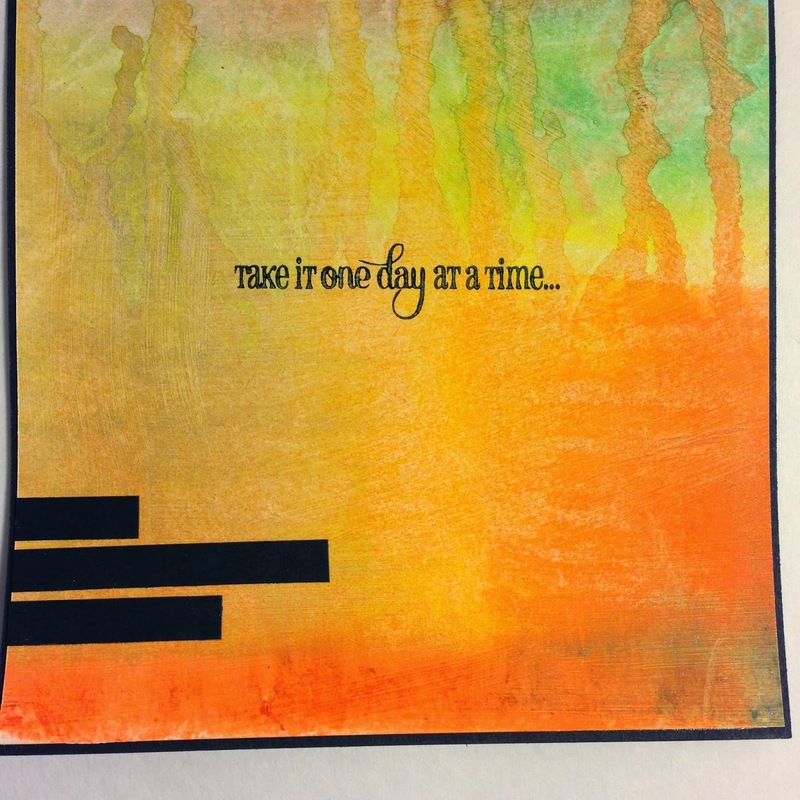 The first card sketch of January was designed by Kelly Holifield. 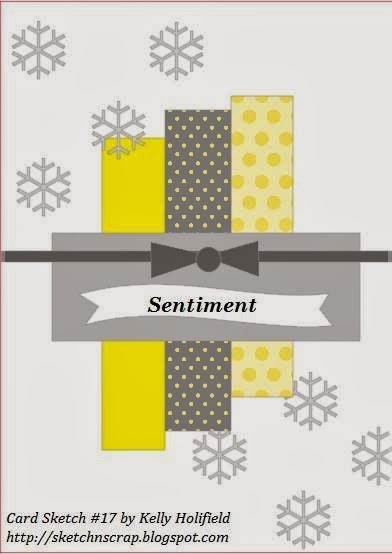 I like this card because it can be for a man or a woman. Now it is your turn! 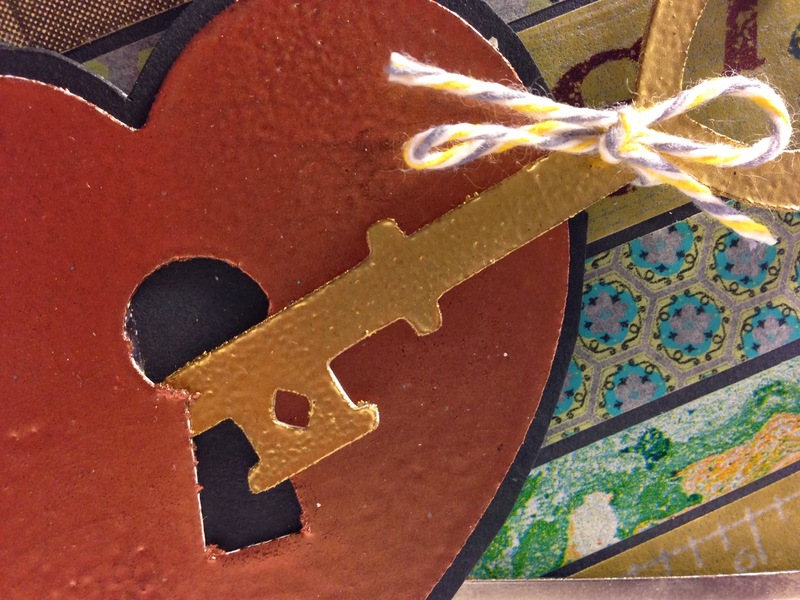 Head over to Sketch~N~Scrap and play along for a chance at this months amazing prize! We have an amazing sponsor to kick off the New Year! January's sponsor is Skyline Paperie! Stephanie Ho is the owner and one of our very own Design Team members! Stephanie opened Skyline Paperie this past December and is offering up a wonderful prize full of crafty goodies to one randomly selected winner! For more details and inspiration, go visit Sketch~N~Scrap. And, til next time, keepin' it crafty! Is it cold enough for you? For those of us in the upper Midwest, all I can say is "brrrrrrr!" Here in my neck of the woods (Michigan), we have had about 8" in the past couple of days. I like how clean and white it makes everything look, but BOY is it cold! 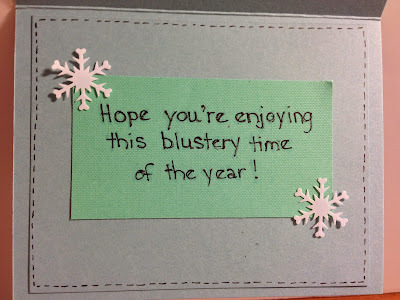 In honor of all this blustery-ness (is that a word? ), I made a very wintery card for my very first post as a Design Team Member for Action Wobbles. I've been using these wobbles for quite some time now, and they are always just so much darn fun! 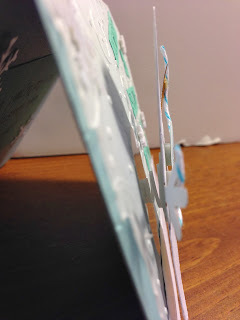 I embossed some vellum using an Anna Griffin folder and adhered that to my card base. I tore some white cardstock for the snow and cut the cute little snowman using my Silhouette Cameo. I also used the Silhouette to cut the sentiment. I hand-drew the face and lettering on his sign. 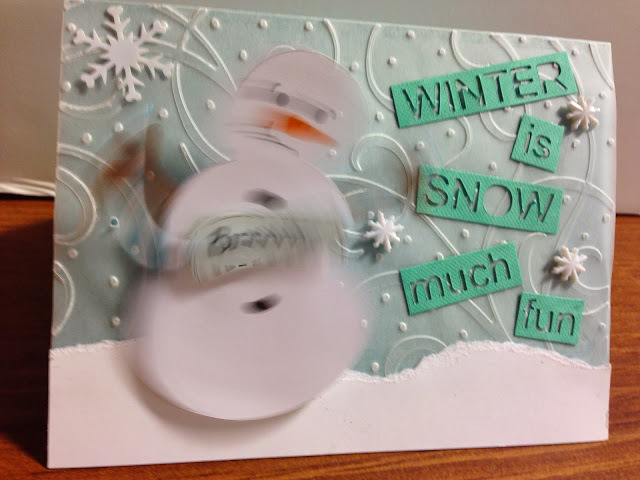 The snowdude was then placed on my card using the Action Wobble. That's what really gives him his character! He shakes just like I do when I go outside! lol For the inside of the card, I just kept it simple. If you'd like to see more ideas on how you can use these wonderful wobbles, head over to the Action Wobbles blog and check out all the cute projects. Want to know where YOU can get some of these for your own? Just visit HERE! I hope you will join us for the weekly Wednesday Wobble Challenge.